86'0" by 6'8" by 6'7"
A number were given large conning towers and two periscopes for training Kaiten crews. A few others were fitted with an explosive warhead for suicide attack. 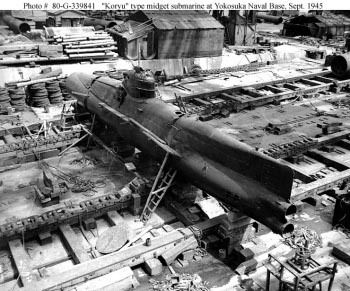 The Type D midget submarines, also known by the nickname Koryu, were basically improved Type C. Their larger diesel generates could recharge the batteries in eight hours. They were to be built in large numbers for defense of the home islands, but of the 570 ordered, only 115 were completed before the surrender.